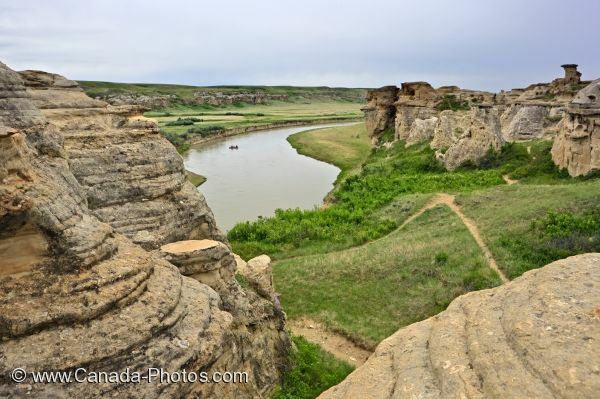 Amongst the Hoodoos in Writing on Stone Provincial Park in Southern Alberta, a raft floats down the Milk River. An easy way to get down the Milk River and view the Hoodoos in Writing on Stone Provincial Park in Southern Alberta, Canada is to relax on a raft. The Milk River flows between these fascinating rock formations and you can easily disembark your raft to get a closer look. A raft on Milk River seen from the Hoodoos along the Hoodoos Interpretive Trail in Writing on Stone Provincial Park, Southern Alberta, Alberta, Canada. Picture of a raft on the Milk River surrounded by the Hoodoos on the Hoodoos Interpretative Trail in Southern Alberta, Canada.